Cobridge Corn Cockle vase 1998. Cobridge Stoneware was a short-lived pottery company born out of the fascination of the head of one of the leading potteries for a process that died with its inventor early in the twentieth century. 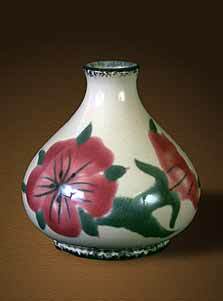 Hugh Edwards, owner of Moorcroft, was keen to develop the ideas of William Howson Taylor - the man behind the closely guarded secrets of Ruskin Pottery. A new company and name was needed for the new range - Moorcroft is known and recognized universally by its distinctive appearance. Cobridge, an area of The Potteries, was featured in the Industrial Landscapes that were planned to furnish some of the designs for the new range. Its skyline was dominated in earlier years by bottle kilns, now mainly demolished, and Cobridge was chosen as the new name. The Cobridge Pottery was set up in a new imposing building a couple of hundred yards from the Moorcroft pottery and the official opening was in September 1998. The building was designed with future needs in mind. Only the outer walls are load-bearing, and the inner walls are built from blocks which can, if the need arises, be knocked down and re-built in another place. Top designers and the most expert paintresses were enlisted for the decorated stoneware, and the products met with much acclaim, but sadly the company closed in August 2005.